Special report The public domain is the greatest resource in human history: eventually all knowledge will become part of it. Its riches serve all mankind, but it faces a new threat. Vast libraries of public domain works are being plundered by claims of "copyright". It's called copyfraud - and we'll discover how large corporations like Google, Yahoo, and Amazon have structured their businesses to assist it and profit from it. Copyfraud first came to my attention nearly two years ago in my scholarly research. As Google Books began releasing massive numbers of newly scanned public domain books, Japanese Studies scholars excitedly announced their discoveries. I found links to books by one of the first American journalists to arrive in Japan, Lafcadio Hearn. Scans of his books from the 1890s onward - with their eccentric letterpress typography and gold foil stamped leather covers - give us the details of presentation and are the minutiae that launched a thousand dissertations. This is just the sort of material that excites scholars like me; we examine his books to see how the West first came to understand Japan. But Hearn's books also have commercial value as public domain works. 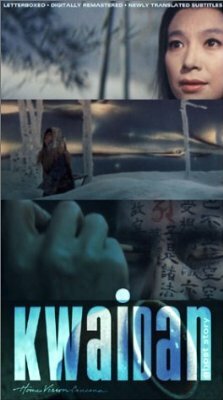 Hearn's book of traditional Japanese ghost stories, Kwaidan was released as a film in 1964 and was nominated for an Academy Award; a modern film homage appeared in 2007. Hearn profited by recording, translating, and publishing a book of traditional folk tales. When his book lapsed into the public domain, it was used again as source material for a copyrighted commercial derivative work on film. This recycling of ancient oral tradition by Hearn helped propel a generation of big-budget horror films, becoming a profit centre for movie studios in both America and Japan. Upon hearing the news of Hearn's work appearing on Google Books, I searched for Hearn's classic Glimpses of an Unfamiliar Japan. Although a freely downloadable scan of Volume 2 was available, only a limited preview edition of Volume 1 from Kessinger Publishing was available, under a 2004 "copyright". 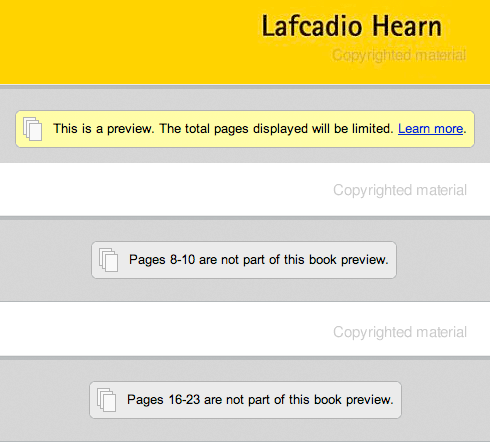 The preview edition was marked "Copyrighted material" on every page. Many pages were omitted, the book is nothing but an excerpt. Another public domain classic disappears. But why? Kessinger made the document useless to scholars, to force them to purchase the full hardcopy edition for $25. Links on the Google Books page directed purchasers to the Kessinger edition on Amazon.com and other online booksellers. Scholars were outraged. These works are clearly in the public domain, dating back to the 1890s and beyond. When questioned, Google said it "must err on the side of caution... until we have determined that the book has entered the public domain." But with the sheer volume of ebooks being submitted by outside publishers, there are obvious delays in clearing rights. Some publishers have exploited this gap, providing copyfraud editions where no free edition was available. Google suggested waiting patiently, as surely these missing volumes would eventually be scanned and added to its free online library. But the practice began to spread. Other publishers followed Kessinger's model and several more copyfraud editions of Volume 1 followed. Nearly two years later, a freely downloadable scan of Volume 1 finally appeared. Some publishers had used the two year gap to profit. We can see the publishers' motivation. Their business model has been ruined. There is a long tradition of small publishers selling facsimiles of rare public domain books. They were a precursor of the print-on-demand online model, collecting and curating large libraries of obscure, disreputable, and uncommercial works on topics like occultism, homeopathy, military history, and crackpot cancer cures, and selling them to niche markets. But with the advent of Google Books, their market has evaporated: the books are no longer scarce. So they fought back the only way they knew how, by exploiting the gaps in Google's book coverage.